If someone attempts to enter, the alarm will sound and the unit will wedge underneath preventing it from opening. Most security products on the market today will only alert you after an intruder has entered. 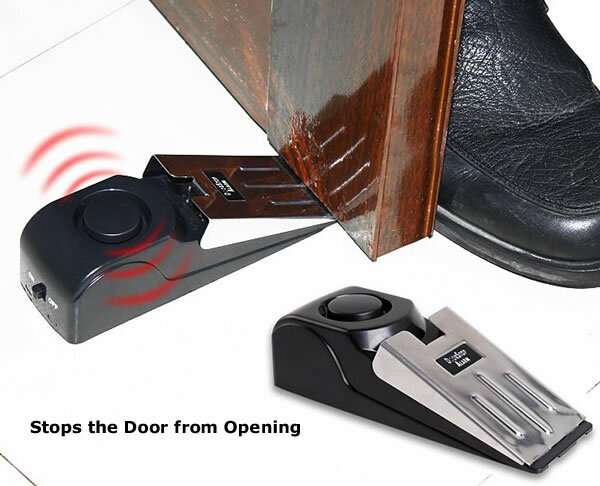 This door stopper will not only activate an ear piercing sound but will prevent unwanted intruders from entering in the first place. If an intruder attempts to enter, the alarm will sound and the unit will wedge underneath preventing it from opening. The wedge-shaped design and non-skid pad on the bottom of the door stopper alarm will hold tighter the harder it is pushed. The sound will not stop until pressure is released from the metal plate. They might pick your lock but they can not get inside your hotel room, apartment, or home when secured by the Door Stop Alarm. Instructions - Place on the floor directly below the knob with the low end of the unit under the bottom edge of the door. 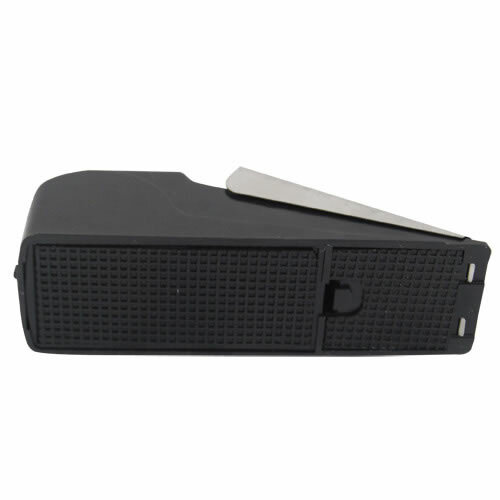 Once opened, it will strike the metal plate, preventing the opening and the 120db alarm will activate. This is also equipped with a movement sensor which will activate the siren if the unit is moved. A sensitivity switch allows you to adjust the amount of movement required to set off the warning. Unit operates with a 9-volt battery. Battery not included. Prevents a door from opening and immediately activates a very loud sound. 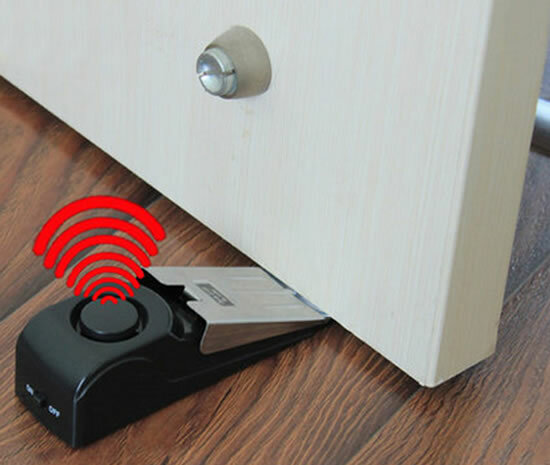 Wedge-shaped design prevents an intruder from entering your home or hotel room. The 120db noise will scare away an intruder, alert those inside, and summon help. Portable security for your peace of mind while traveling. No installation required - just set it in place and switch it on. Approximate Dimensions: 5 1/2" x 2" x 1 1/2"
You're home alone, your imagination runs wild with every noise you hear, you automatically assume someone is trying to get into the house. What do you do? Do you get up and check every time? 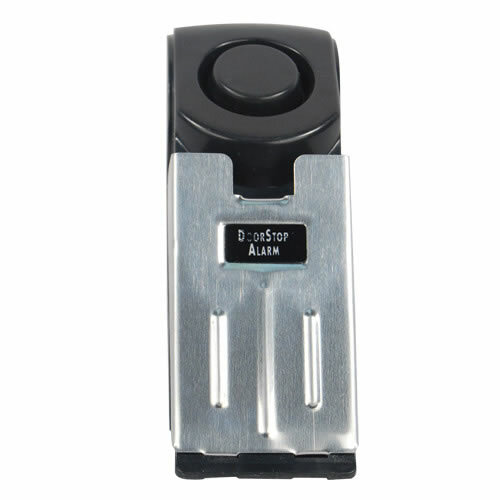 If you are looking for an added sense of security while you are at home alone, the DSAL-2 is a good solution. This is a small but handy device you can use to know for sure whether someone is attempting entry. One, it lets you know when someone is trying to enter the home with a loud alarm. The second is it prevents the intruder from actually getting in by wedging the door shut and physically preventing the door from opening. This security device is placed on the floor, up against and underneath the bottom of the door. 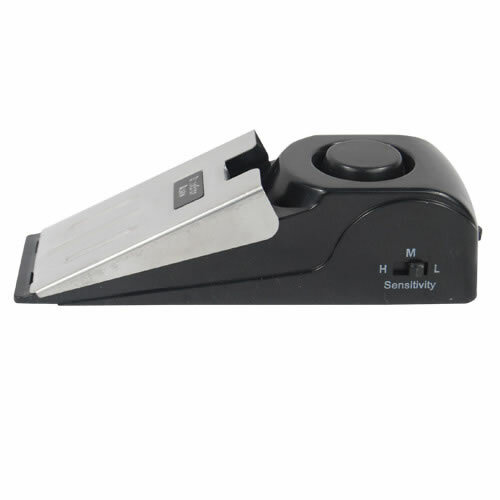 The sloped edge of the device is actually a metal contact. When the door is pushed up against the metal, it causes the alarm to go off alerting you that someone is actually trying to open it. Much better than wondering, right? There is no difficult installation. Just install a 9-volt battery and place the item in front where the tip of the wedge is slightly under the door. When someone attempts to enter, that movement will push down on the metal plate causing the alarm to sound. The 120db alarm will simultaneously scare away an intruder, alert the people inside, and make enough noise that someone else will be alerted and possible summon help. The base of the unit is forced downward by the pressure of the opening and makes it stay in place. This stoppage serves as a reinforcement base and actually prevents further opening. The DSAL-2 is the ideal alarm for traveling while staying at a motel. Fits nicely in luggage and does not require external power. And if you are traveling out of the country, there are no converters needed. You can use these on any entrance you want to protect. If anyone tries to gain unlawful entry, you will know it and the person trying to get in will know you know as well. These little gadgets have been around for a while now. 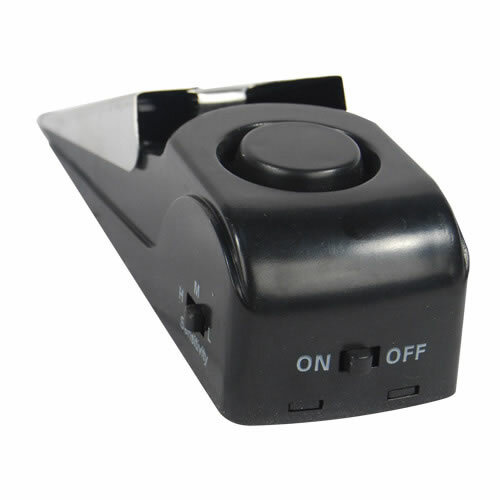 A stopper alarm is simply a wedge-shaped device that you place at the inside edge of a door. If it is opened, it depresses the trigger on the alarm, activating a loud siren. Very simple, very easy, and difficult to avoid if you're the one on the other side trying to be sneaky. However, these are also great for other applications. One of the best is to use it in conjunction with some sort of tripwire. Here's how that works. Run the wire across a hallway. Affix one end of the wire to a wall or some other stationary object. The other end gets attached to a small stick. This stick is wedged under something fairly heavy, such as a thick book. The alarm is placed under the heavy object. Think of this as something akin to a deadfall trap, where the device is taking the place of the critter being trapped. If someone or something trips the wire, it pulls the stick and the loud siren is activated by the falling book. Even with trip wires, think outside the box. We are somewhat conditioned to think of them as primarily being used in doorways or perhaps hallways. However, unless you really know what you're doing, quite often these sorts of applications are very easy to detect. Evading them merely involves stepping over the wire. Instead, consider other applications of this basic principle. For example, rather than waiting for someone to literally trip over the wire, attach the wire to something that would need to be moved aside in order for someone to enter the area you are securing. Let's say you have a garage or storage shed out behind your home. Your concern is people walking along the back side of that shed, between it and the fence that borders your property. Rather than stringing a trip wire across the path, place some branches or brush across it. Attach the trip wire to the brush and when someone moves the branches aside, it activates the alarm. Perhaps instead of securing an area, you want to secure an item. Attach the trip wire to the item itself. Removing the item from the shelf serves to activate the alarm. Of course, the wire will need to be attached in some unobtrusive way, so it isn't obviously alarmed. The point to all of this is to get creative with security solutions. Think outside the box and consider different applications for the gear and equipment available to you. This device works well when it reaches the bottom of the door (I had to put a 1/4 inch piece of wood under it). But the alarm sound is deafening!